What is Jamieson Omega 3-6-9? 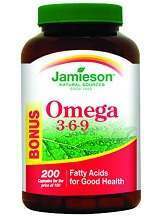 Jamieson Omega 3-6-9 is a great pick for an omega-3 supplement. The goal of the product is to support health. We were very excited with this product as it provides Omega-3 as well as Omega-6 and Omega-9. This product is made from distilled fish and is gluten-free. It comes in the form of softgels. This product is made from non-GMO flaxseed oil, borage seed oil and molecularly distilled fish oil as well as gelatine and glycerine. This product includes no sugar, gluten, lactose and has no artificial colors and flavors added. This product consists of softgel tablets. One softgel tablet should be taken daily, with a meal. It is recommended that the customer ingests this tablet with a substantial meal, together with a glass of water, to make it easier to swallow. The product is sold in two different formats: a bottle of 30 tablets for $13 and a bottle of 80 softgel tablets for $25. No offers, deals or any type of discounts could be found for those who may have wished to buy several bottles of this product. Consult a doctor before taking these tablets to avoid any possible issues, especially if this supplement is taken whilst taking other prescribed medicine for blood thinning or blood pressure medication. If pregnant, nursing, undergoing any other medical procedure or taking any other type of supplements (such as dietary ones), consult with a healthcare professional before starting to take these Omega-3-6-9 supplements. The manufacturer does not offer any type of guarantee at all which may make the customer doubt on whether the product achieves what it claims to or not. Furthermore, not many reviews could be found about the product which may create further doubts about the product’s performance. Jamieson Omega 3-6-9 offers the benefits of three types of omega fatty acids which is fantastic. We also like that the sources are not only fish (which helps with the aftertaste) and they come from reliable, sustainable sources and are not GMO. We are disappointed that the manufacturer does not offer any type of guarantee and hardly any reviews could be found. It deters consumers from trusting that this is a good investment.